"The Good Person of Sichuan." 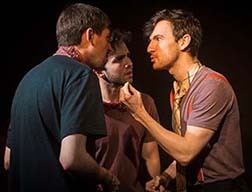 Written by Bertolt Brecht, translated by Michael Hofmann, directed by Kristine Landon Smith. Original score by Graeme Du Fresne. The Italia Conti Ensemble at theSpace, Edinburgh Festival Fringe. Bertolt Brecht's "The Good Person of Szechwan" (Der gute Mensch von Sezuan) is often translated less literally as "The Good Woman of Setzuan." 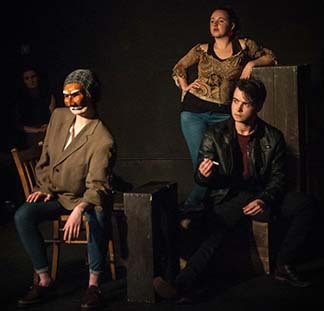 Here a group of second-year students at London's Italia Conti Academy of Theatre Arts gets the right translation, uses working class Scottish, Brit and Irish accents to establish class, and does a very good modern interpretation, realism tempered by abstraction. Three wise men need to find a good person, to prove that there can be one. They come upon a water seller, Wang (Jonny Amies), and ask for a place to stay. The only person he finds to offer them a room is Shen Te, a prostitute (Natasha Calland in first half of the run, Hannah Morrison in the second). She has been trying to survive with what she earns as a "lady of the night." But with the money she gets from the gods, she buys a tobacco shop from Mrs. Shin (Jessica Hume). And she invites in the poor. 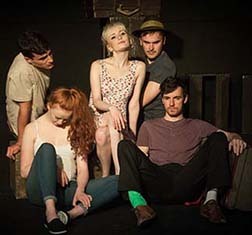 The Family – Louis Boyer as Husband, Hannah Morrison as Sister-in-law, Zoë Hickson as Niece, George Hayter as Brother, Simon Hannon as Nephew. Photo by Caitlin Taylor. After being taken advantage of for being too "good," Shen Te invents a male alter ego, Shui Ta, her supposed visiting cousin. The back story is about predatory capitalism. Her greedy family takes what they didn't earn. A carpenter (Patrick Medway) demands $50 for shelves he has built. The "cousin" offers him $2 for the shelves. Shui Ta does not give handouts the way Shen Te often did. He throws the poor out. A young pilot, Yang Sun (Cameron Percival) arrives. A hanger manager will give him a job for a $500 kickback. Shen Te falls in love with him. She will give him her money. But he will take advantage of her. It turns out that Yang Sun is selling cocaine. Hannah Morrison as Shui Ta, Jessica Hume as Mrs Shin, Cameron Percival as Yang Sun. Photo Caitlin Taylor. I've seen this play with professional companies. Kristine Landon Smith's production does not suffer by comparison. With sets mostly of piled boxes, the actors fit quite well into the Brechtian underclass. The jazz music, a good substitute for the Kurt Weil sound, is scored by Graeme du Fresne, with actors as the band. The students are skilled and the staging inventive. The production is worthy of Brecht.